I did some day of birth morning shoppin at Bloomingdale's with my moms (so old school)...I can't remember the last time my mom took me shopping, but it was kinda fun. 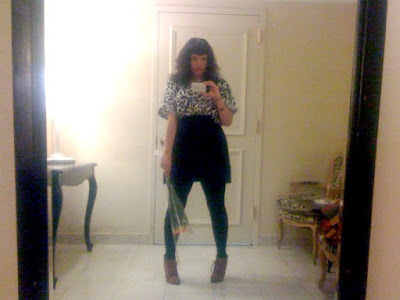 I realized my selections made a dope outfit and so I changed before my Birthday Lady Tea. Decadence in my new year? Pretty flowers from Molinga, friendship bracelet from Kat, antique scarab bracelet from Keren, flames-cuff-from-her-"SF in 1994"-vice party Halloween costume (not pictured, um, OOPS) from Veevs. 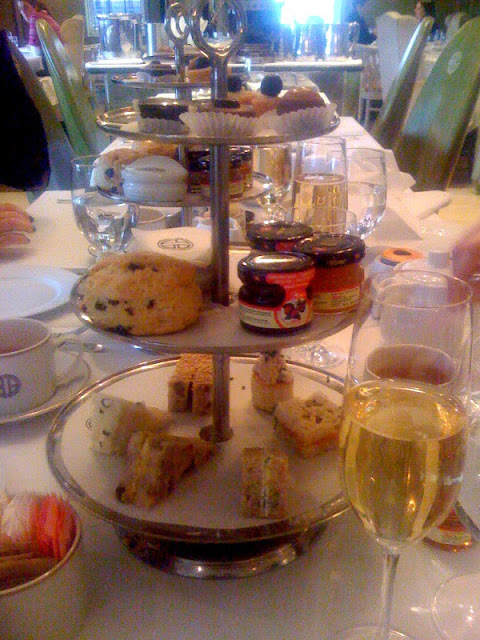 I HIGHLY recommend afternoon tea at Bergdorf's, BY THE BY. It is so choice. It is not sooo expensive and the dopeass interior is White Lightninglove KELLY WEARSTLER designed (she of the ba-nonkers hats and outfits) and you overlook the park and IT IS FANCY FUN to eat tiny sammies and clotted cream. I LOVE TEA SAMMIES ! And I love my friends and I love boygossip and I really love Champagne before it gets dark. I realized something at this table: All my best girlfriends are loud funny pottymouthed epic storytellers. And with the exception of Kat's enviable ginger locks, they are all saucy brunettes (gals who were not able to attend bc of work/or live in other countries INCLUDED). JUST. SAYING. 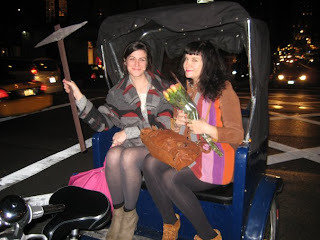 The last perfect moment came by way Keren "Pickaxe" Richter who hailed a PEDICAB to get us to the next destination. PS, I have NEVER in my life been on such a contraption and I declare it one step above riding on the handlebars of a bike. (also...really really fun). QUITE the day..thank you ladies ! Yay! I'm happy your birthday way epic. I'd go to Bloomingdales for afternoon tea if I could, I'm turnig 20 soon! Eep. "...so dope I pretend they're Timberlands." EPIC LINE. I am still completing my day of birth shopping - about 1 month later - university interrupted the celebrations. you took one of those! hahaha was it fixed gear? i think i want to make a tiny sandwich headpiece during the next crafternoon.